When one cooks meat, the goal is to get the internal temperature of the meat to whatever value indicates that the meat is tender and delcious. For most meats, this is in the 50 °C – 65 °C range. However, to cook them expediently we use cooking surfaces that are significantly hotter than that — a frying pan on high can get up to 240 °C, four times the target temperature! The result is that the outside of your steak is cooked to 200 °C so the inside can be 55 °C. Sous vide is a method of food preparation that operates on a simple principle; instead of using a cooking surface that is very hot so the food cooks quickly, use a cooking surface that is exactly the temperature you want your food to be (or, if you're impatient, slightly above). Then, all you need to do is let your food reach thermal equilibrium with the cooking surface and it's ready to eat. 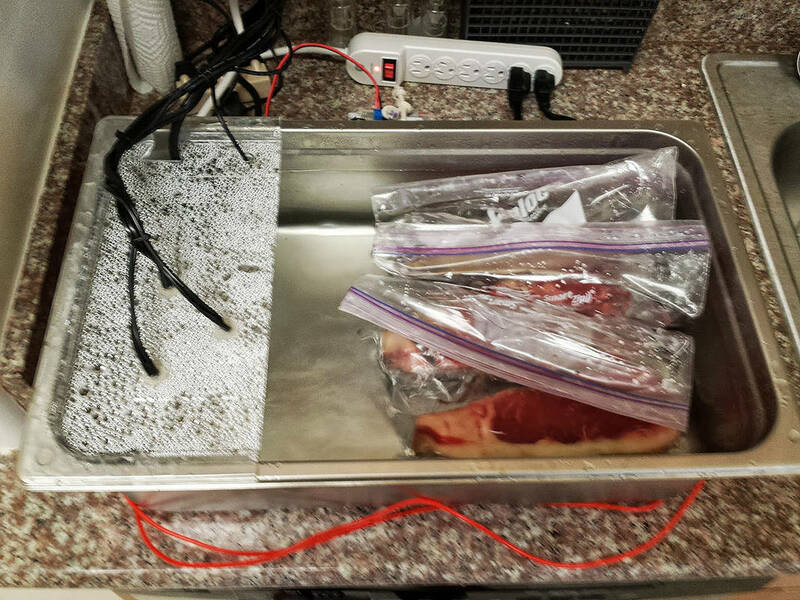 A sous vide cooker uses a water bath as the heating surface, and the temperature of the water is very precisely maintained at the desired temperature of the meat. The food is then sealed in a plastic bag to prevent moisture from escaping and placed in the bath. Cooking times range from 20 minutes to 72 hours, but when your meat comes out, it's done perfectly all the way through instead of great in the middle and dry on the outside. The sous vide cooker I made was built entirely from scratch; I wrote my own UI, my own controller and built the hardware and the tank. I wrote this page with the intention of making it easier for people to do what I did and build a cooker from scratch. 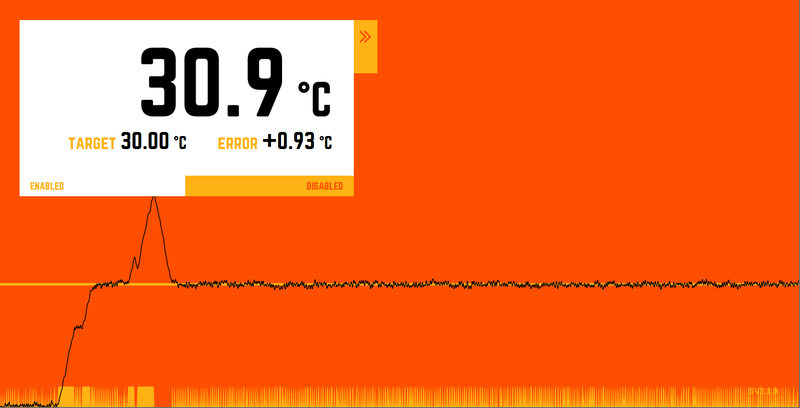 Many of the resources online for building sous vide cookers describe how to build one assuming you have a PID controller, or using a hacked-together UI. I wanted to build a professional-quality controller in an integrated system, and I couldn't find anyone else that had done so and posted documentation. If anything here is unclear or missing detail, please don't hesitate to email sousvide@haldean.org with any questions or suggestions for additions to this page. I started designing and building my sous vide in July 2013. As of August, I've got version one (SV1) of the hardware completed and I am upgrading it piecemeal to version two (SV2). All of the hardware and software sources for the SV1 and SV2 builds can be found on Github. The hardware running all of the control systems is dead-simple. A Raspberry Pi runs all of the control software as well as the web server that provides the UI. 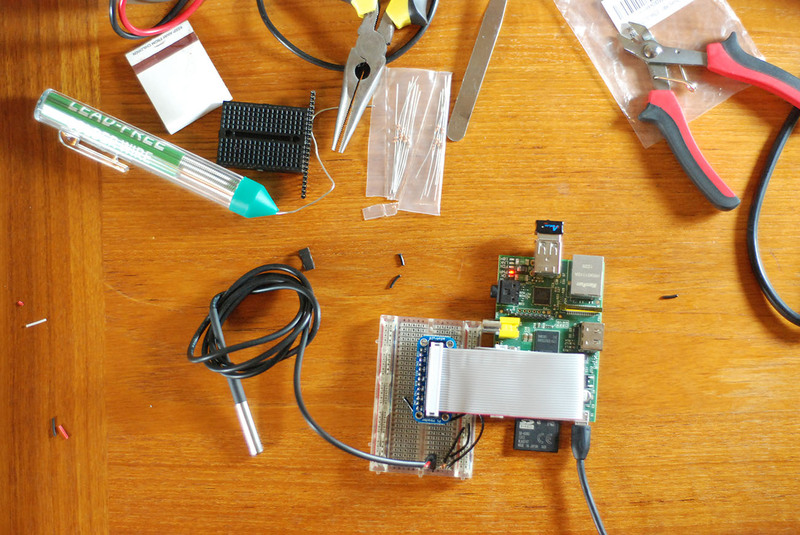 The Raspberry Pi's internal GPIO is used to communicate with the two peripherial electronic devices: a PowerSwitch Tail for controlling the heaters and a digital temperature sensor for measuring the water bath temperature. The PowerSwitch switches three immersion heaters connected in parallel. Also present is a submersible pump that recirculates the water to maintain a more homogenous temperature field, which gets its power from the same circuit that powers the Pi (and is thus always on when the cooker is plugged in and switched on). There is a master switch that controls the whole cooker that turns the Pi on and off. Working on the SV1 electronics build. Breadboarding the circuit for SV1. 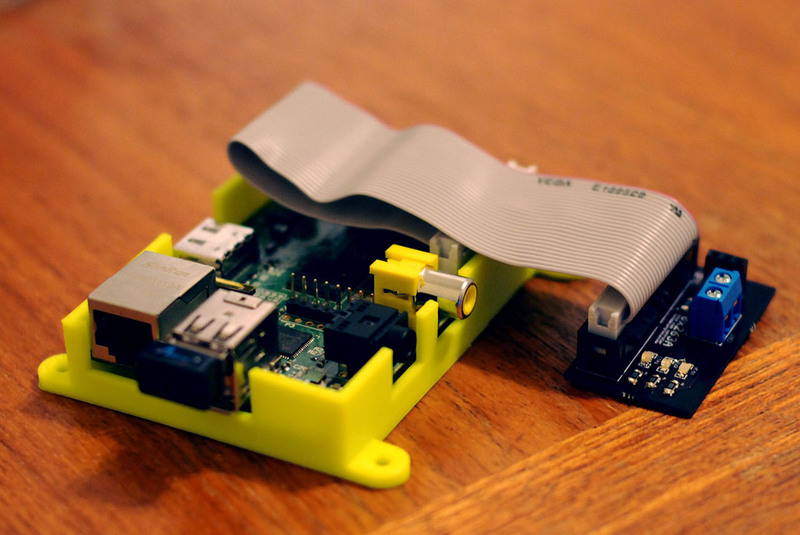 The Rasperry Pi gets it's link to the internet through a tiny WiFi adapter. It's running Occidentalis, a fork of the Raspbian operating system that bundles a number of kernel modules that are useful for hardware hacking; in particular, in includes modules for the WiFi adapter and the w1-gpio and w1_therm modules, used for the 1-wire temperature sensor. Schematic of the PCB designed for the SV2 build. 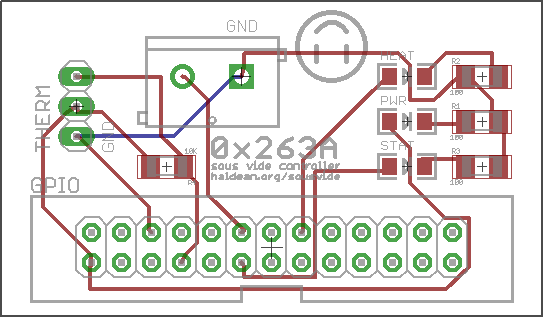 PCB layout for the SV2 build. For the SV1 build, I connected the Rasperry Pi to the peripherials using a Pi Cobbler from Adafruit and a breadboard. 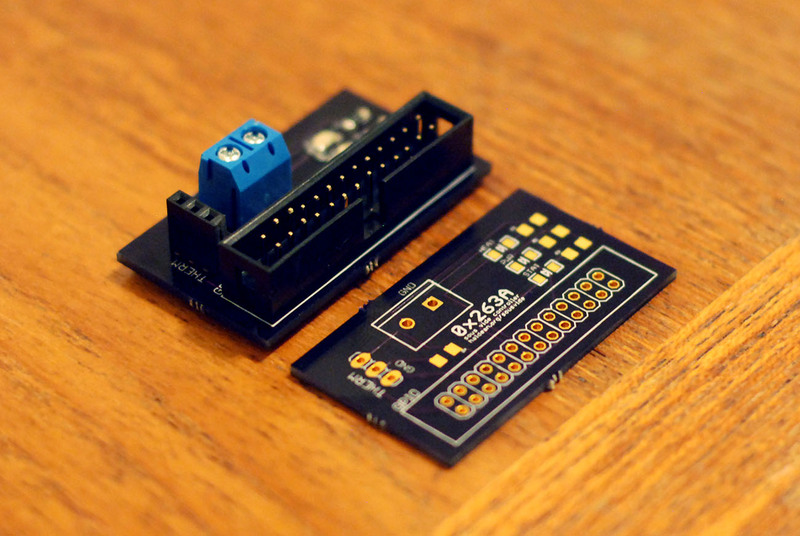 For the SV2 build, I designed a PCB to serve as a breakout from the Raspberry Pi's GPIO header to the necessary peripherials; the designs for the PCB can be seen in the pcb directory of the project and can be ordered from OSH Park. The SV2 build with the PCB. The PCB (populated and unpopulated) for the SV2 build. The SV2 board also adds some status LEDs; there is an LED for displaying system power, an LED for displaying whether the heater is on and a status LED whose purpose has not yet been decided. 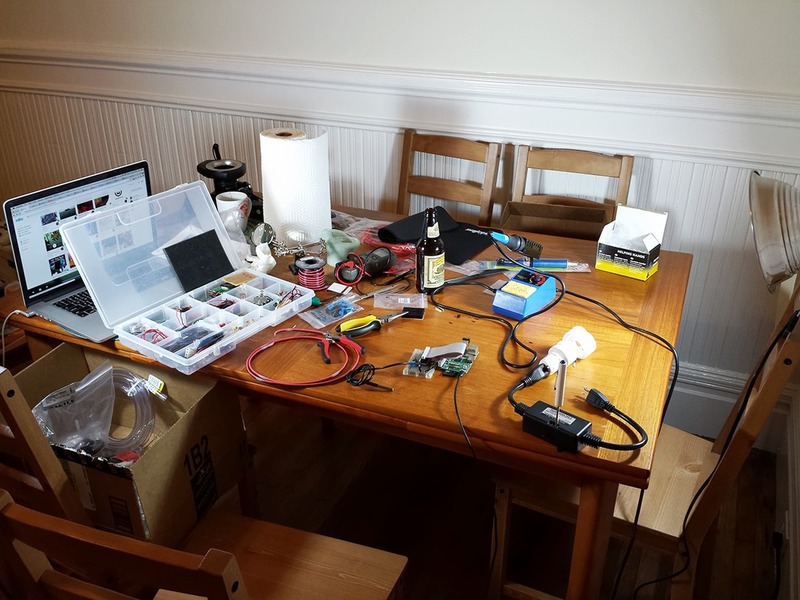 The heater is connected to the PCB by screw terminals, the thermistor by a female header, and the Raspberry Pi by a 26-pin ribbon cable, all of which were bought from Sparkfun. All other parts are surface-mount and were bought from Mouser. The total BoM cost for the electronics and hardware came out to $128. The UI of this sous vide cooker is all provided through a web interface that is simple, easy-to-use and mobile-friendly. I'm putting the finishing touches on an Android app that can be used to control it as well. The UI is provided by a Go backend that runs directly on the Raspberry Pi. The backend provides both the control loop and the UI; this has the advantage that the UI can surface a lot of debugging information directly from the control loop if needed. The output of a PID controller is continuous and unbounded, but I need a single binary output, so the continuous output has to be mapped to a binary on/off somehow. The integral term of a PID controller is pointless in a binary system. From a handwavey perspective, the purpose of the integral term is to make the machine "try harder" when the system is not responding adequately to the control. In the case where the controller gives a binary output, "try harder" has no meaning. The integral term will often cause an overshoot in a slow-moving system like this one, and it's more important that the food never exceed the cooking temperature than that it heats up quickly for cooking sous-vide. The combination of these three led me to do two things: first, I completely eliminated the integral term, effectively making a PD controller. Often, in industrial systems, the derivative term is ignored and a PI controller is used, because the input signal is noisy and thus the local derivative is not particularly useful. However, the sous-vide cooker is a very slow-moving system and the thermocouple I used is extremely stable — there is almost no noise in it at all — so the derivative actually ends up being a very useful term. Since the system is very slow to respond to the heaters, you need to be very proactive in turning them off when you get close to the target value. The second unusual thing I did was that I binarized the output of the controller; an output from the controller of greater than zero corresponds to heaters-on, and zero or less corresponds to heaters-off. Doing this has the nice property that constant scaling factors do not matter when tuning the PID parameters; since only the sign of the output is used, it does not matter if the parameters are scaled because the sign will not change. After a few hours of fiddling and trial-and-error, I settled on a P-term of 1 and a D-term of 2. This reflects the importance of anticipating the approach to the target value; since the heaters stay hot after they've been turned off, the controller has to compensate by turning off the heaters early. Conversely, when the system starts cooling down, even if it's above the target, the controller needs to turn the heaters on in anticipation because they take a while to come to temperature. I've gotten this question a couple of times. Pulse-width modulation (PWM) is a method of "dimming" a device that typically only has two states, on or off, that works by switching the device on and off rapidly many hundreds or thousands of times a second. It could work well in the sous vide system as a method for turning the heaters partially on, which would let me (theoretically) maintain a more accurate temperature in the water bath. The reason I didn't use PWM is because high-frequency switching of mains-voltage AC loads is tricky, potentially dangerous (high frequency switching generates a lot of heat), and unnecessary for this; it's able to maintain an accurate temperature without any sort of PWM. The same argument goes for waveform clipping; although it's not dangerous, it can be tricky to get right and it's not needed. The physical design went through a number of revisions before SV1 was functional, and then some minor revisions before SV2 to make getting in and out of the cooker more convenient. I initially wanted to create it as an integrated solution in a cooler for the nice thermal properties that a cooler would have, but this proved fruitless; the walls of the cooler were too thick to mount anything on, and the lid was difficult to cut with the hand tools I had on hand. The SV2 build with the lid on. I ended up building it in a stainless steel food service container with a plastic lid. 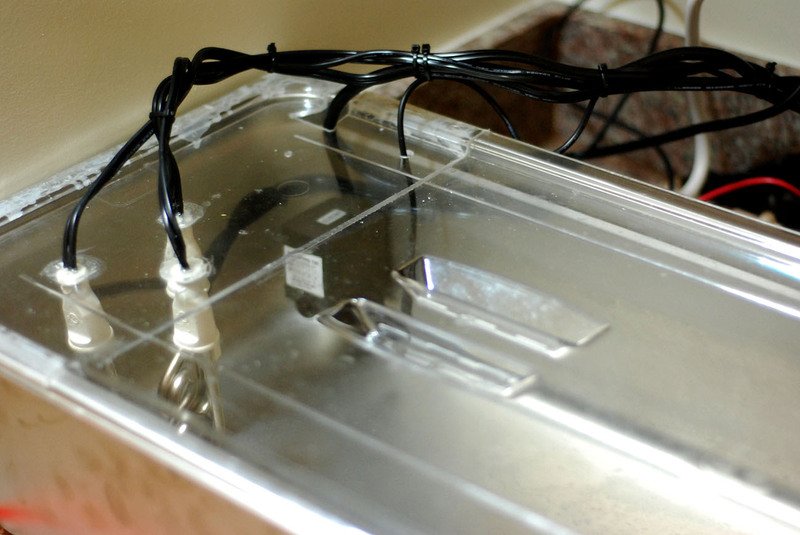 The lid had three holes drilled in it that were the approximate diameter of the cords for the heaters. 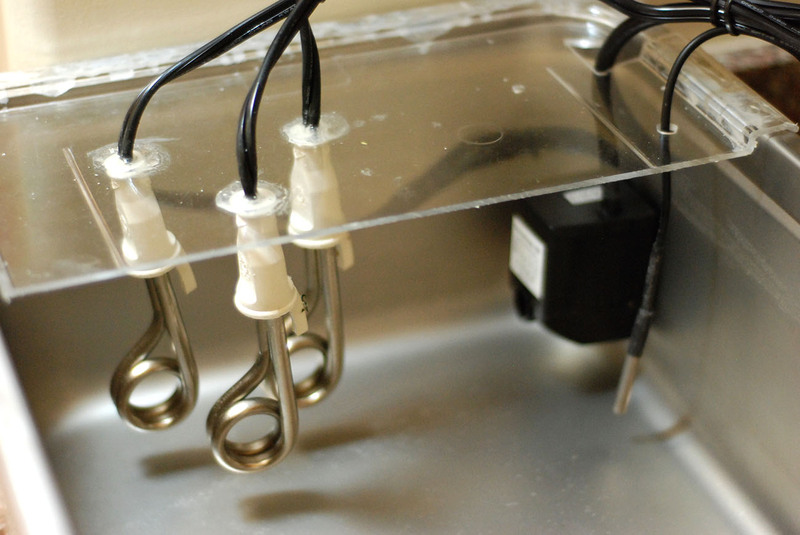 I then snipped the plugs off of the heaters, threaded the cords through the lid so the heaters were hanging down but flush with the lid, and filled the holes with food-grade epoxy to hold them in place. I replugged the heater cables and attached them to a 3-outlet adapter which plugs into the PowerSwitch. The pump has suction cups on the back and is mounted to the side of the tank so that the output of the pump flows over the heaters. The cable snakes out of the tank via a notch cut into the lid of the tank. The thermistor hangs from another hole in the lid so that it is a few inches in front of the impeller of the pump. I chose to not epoxy the thermistor in place so that I could move it around the tank to test the homogeneity of the water temperature. The business end of the SV2 build: three heaters, pump and thermistor. The three components internal to the tank (pump, heaters and thermistor) are all clustered at one end of the tank. I sawed the lid into two pieces; the shorter piece, about 20 cm long, has the heaters mounted to it, as well as the notch for the pump cable and the hole for the thermistor, and is epoxied to the tank to keep it stationary. The longer piece is about 60 cm long and can be freely removed to get food in and out. This is a feature of SV2; SV1 had a single lid piece with the heaters on it, which meant that you needed to disable the heaters to insert/remove the food. Often, that is when the most thermal noise is introduced to the system, so it was important to modify it so the heaters could compensate while I was mucking around in the water. The main power for the system is provided to a power strip, into which the Raspberry Pi, the PowerSwitch and the pump are plugged. In SV2 (or maybe SV3) all of the components that are not mounted to the tank will be enclosed in a small box (the PowerSwitch, the Raspberry Pi and the power strip) but I haven't finalized the design for that enclosure yet.